To some newsjacking may sound like a black hat technique but it is perfectly appropriate when done ethically. 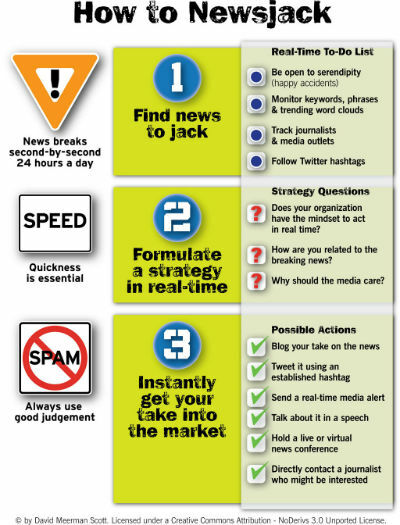 I wrote about the ideas in my brand new book Newsjacking: How to Inject your Ideas into a Breaking News Story and Generate Tons of Media Coverage. Newsjacking is a quick read (most people tell me they finish in about an hour) and is published in electronic-only format for Kindle, Android, Nook, iPad, and the like. The challenge for reporters is to get the “why” and the implications of the event. Why is the company closing its plant? The corporate website may offer some bogus excuse like “because it wants to spend more time with its family.” Competitors may quote some expert’s speculation on the real reason, but a reporter can’t cite that without adding something self-demeaning like “according to an expert quoted in the New York Times.” Journalists need original content—and fast. If there is one organization we all count on for a quick reaction, it’s the fire department. So it is encouraging to find that the London Fire Brigade (LFB) is able to newsjack at lightning speed. Sir Richard Branson was hosting actress Kate Winslet and 20 other guests at his private Necker Island retreat in the British Virgin Islands on August 22, 2011, when lightning struck the wooden building and set it ablaze. Winslet helped rescue Branson’s 90-year-old mother from the inferno. News of the rescue, along with photos of the dramatic fire, quickly became the lead story in media worldwide. But the story was thin, few outlets had an original angle on it, and no one had reporters in the British Virgin Islands. For editors in the ferociously competitive UK media, situations like this are hideously stressful. So imagine their collective relief when the local fire brigade showed up to the rescue. 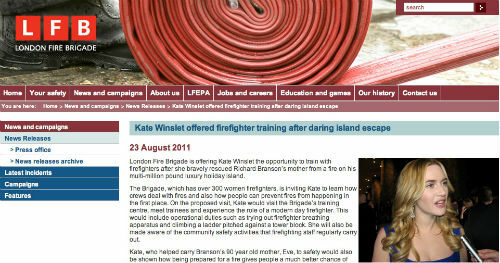 This clever newsjack got the LFB huge attention, as the offer to Winslet was featured by news outlets worldwide. What the LFB did—quickly posting the Winslet offer on their site and alerting reporters—took no more than a few hours and probably cost nothing. But the resulting media exposure was worth millions. It was a gambit that succeeded because the timing and the message were perfect. It also got LFB ranked highly when people search on the fire. Today’s tools such as blogs and YouTube videos gives us the ability to communicate instantly, yet most marketers have not developed the communication skills to address real time. Marketers have been trained with a campaign mentality, spending weeks planning, designing and executing in a sequential manner. 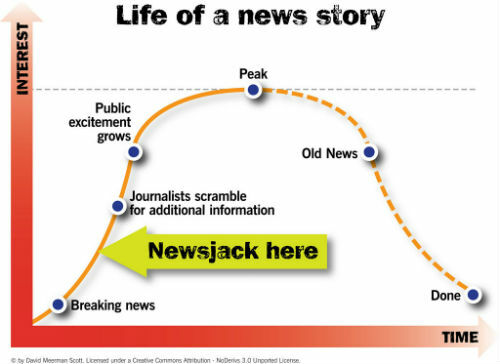 Social marketing is changing that and as people see the value of newsjacking, I hope we change quickly. We now have the ability to react instantly to breaking news. Marketers need a new mentality, infrastructure and workflows to meaningfully participate in real time. 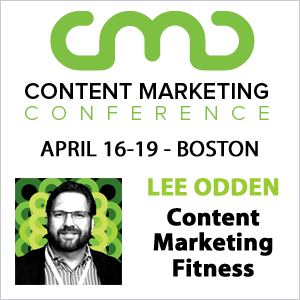 Hi Lee — Thanks for the opportunity to do this guest post. Happy newsjacking. Thanks David, looks like our Google ranking for Newsjacking exemplifies the second paragraph principle 🙂 (at least for today) Thanks for contributing, we’re big fans of your work. I saw this eBook on another blog, bought it on my phone through Amazon Kindle, and read it on downtime at my day job. It really does a concise job at showing you just what you’re trying to accomplish by inserting yourself into the news, and specific examples of how it was done in the past. Agreed Lyndsy – it’s a great (and quick read) resource for understanding how to apply real-time PR tactics towards marketing outcomes. Nicely observed, nicely reasoned, and even better illustrated. getting caught doing something they shouldn’t, etc. minimise their causes and save lives/property. to the critics who say PR is non-strategic, non-essential and lacking in sophistication. Andy, while it is certainly true that people have been reacting to news in order to get their organization into the news for decades, what has changed is the real-time nature. With Google now indexing in real-time, a blog post like the one done by LFB is instantly indexed and immediately findable by journalists. That opens up opportunities that we did not have even a year ago. Fair point David. I guess in the past we’d have just phoned an international news agency, given them the story tip-off and let them propogate it for us. We could, of course, still do that because perhaps it carries more certainty (and more credibility because of the percieved value of their endorsement) than waiting to see if anyone finds and picks it up from Google. Thanks for the opportunity to do this guest post. Happy newsjacking.